Mulled wine and pears: Start with peeling your pears, keep the petiole on and extremely carefully scrub the seeds out from the bottom. 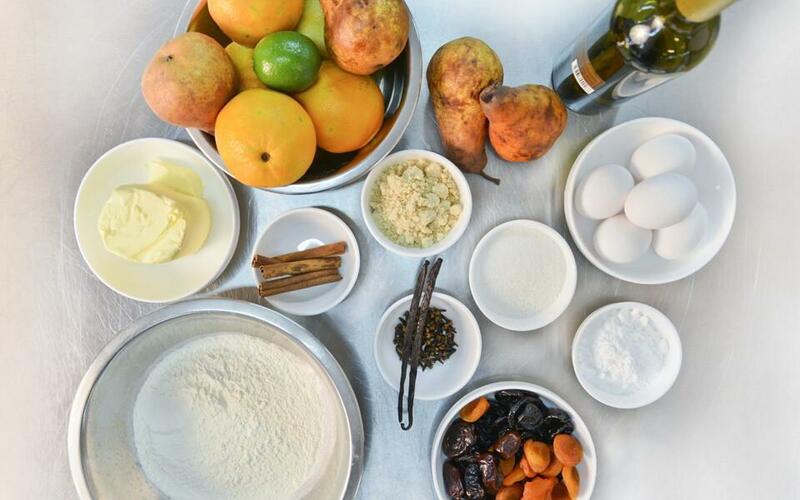 Prepare wine with spices and citruses. Heat up your sugary wine on a fire; add lemon and orange juices, grated zest and spices. Do not bring to boiling. Move the pot from the fire and toss pears in it. Cut out an oil-paper in a size of the pot diameter, top it on mulled wine surface, put the lid and leave it for 3 days. 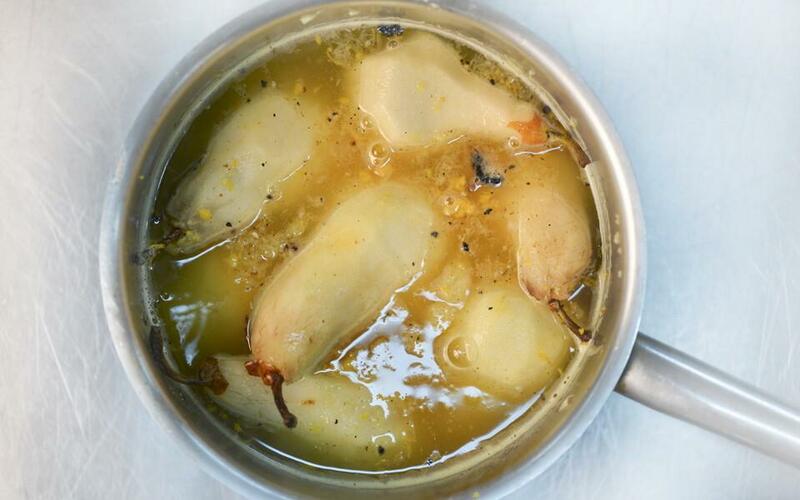 Turn sides to the pear few times a day, in order to soak from all sides. If the pears are quite hard, heat up the mulled wine together with the pears and repeat the procedure during all three days. Dried Fruits: Cut the dried fruit into small cubes, pour half of mulled wine on it and let it soak for 1-2 hours. Shortbread dough: Mix the almond flour, salt, vanilla seeds, sugar powder, baking powder, and flour. Add chopped crème butter, egg yolks and knead a flexible, soft dough. add some flour if needed. Wrap the dough in a plastic bag and keep in fridge overnight. Next morning flatten the dough on 0.3-0.4cm. Cut out 12cm diameter circles and place them in 8cm tartlet pans. Cut the leftovers. Pierce the bottom with a fork and keep in a fridge for 30-60 minutes. Preheat the oven up to 180C. Bake the tartlets for 10-15 minutes or until it turns golden. Lemon-lime cream: Wash and dry citrus, peel it and make squeeze its juice. Mix zest and sugar with your hands. Mix lemon juice, sugar zest, and egg in a small pot. Place in the simmering water of a bigger pot and whisk until it goes up to 83-84C. Do not bring to boil, it will only start smoking heavily. Let the pot cool down to 60C. Move the cream in a blender, add some butter and whip for about 10 minutes. Pour the cream into a jar, or any other vessel and cover it with a lid or a cellophane. Keep it in a fridge overnight. At night the cream will get a condensed, airy consistency. 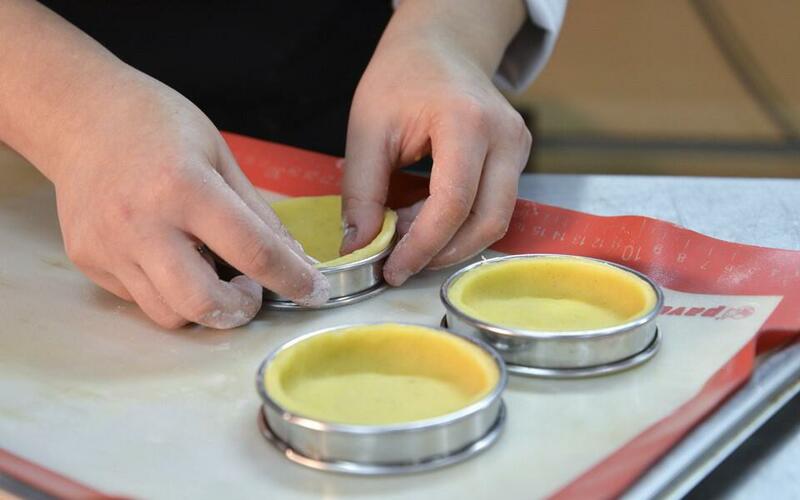 Setting: Fill the tartlets with lemon-lime cream in half. Take the pears out and weep with a paper towel. Fill in the bottom whole with dried fruits. You can add some chopped pistachio if you like so. 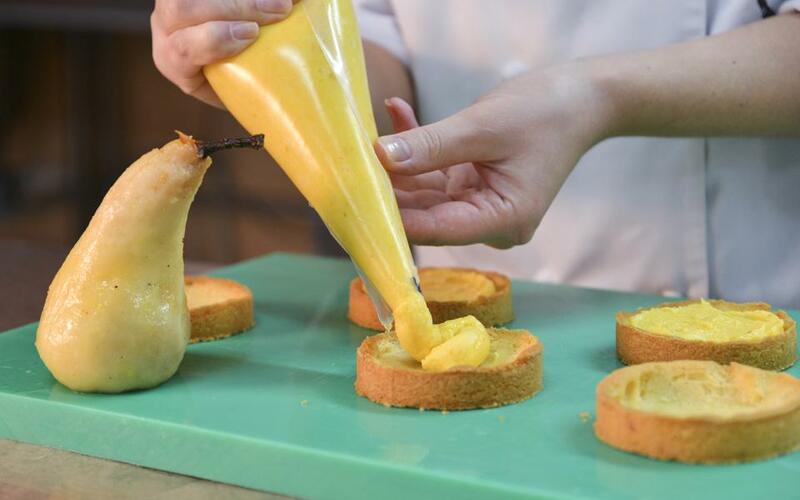 Place the fill out pear on the tartlets and its cream and glaze the whole cake. You can also decorate them with some pistachios. 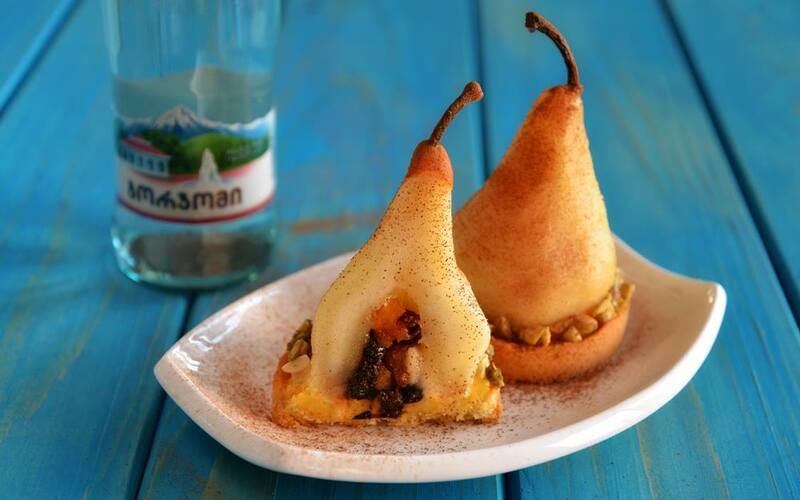 Place the pear into the tartlets and add some grounded pistachios.